The entry level theory course is the Day Skipper shorebased course. Buy a comprehensive RYA online Day Skipper course and start working towards your next qualification today. The course covers all the topics of the shorebased course that we provide in the classroom online. A full functioning learning programme with animated graphics and quizzes that gives immediate results. The Day Skipper course even works on mobile devices, so you can learn wherever your fancy takes you! There are no pre-course requirements for this RYA Day Skipper theory course, but some sailing knowledge is helpful. The RYA Day Skipper course is made up of detailed lessons, most of which are animated for easy learning. Each lesson is followed by a set of questions which can be answered online. Once an answer is submitted, the feedback is instant in the form of a detailed answer page. Some answers will be forwarded to your instructor, who will provide personal feedback and help where required. You will receive RYA Certification on satisfactory completion of the course. 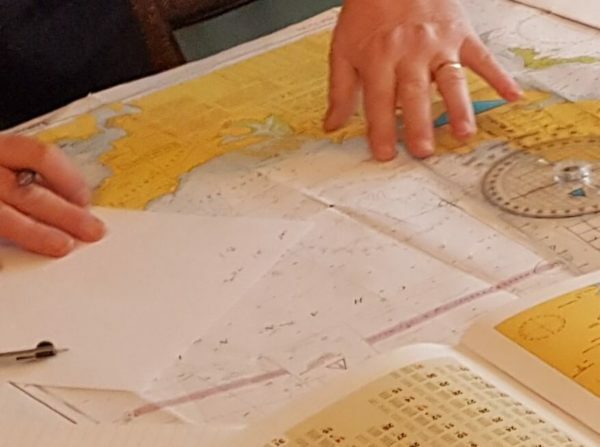 This RYA Day Skipper course is provided by Navathome, a RYA recognised training centre specialising in online training. There is a six-month initial access period. In the unlikely event that you need more time, there is an option to extend at a cost of £30 per extension period (3 months). The course will cover: the basics of seamanship; the essentials of coastal navigation and pilotage; chart work; electronic charts; position fixing; plotting a course to steer; weather forecasting and meteorology; tides; collision regulations; construction, parts and equipment of a cruising boat; emergency and safety procedures including distress calls, use of flares, safety harnesses, lifejackets and liferafts.